Captain Pat O’Shea invites all our members to join him on his home course of The Royal Curragh Golf Club just outside Newbridge for the 2016 Captain’s Day. The tee is booked from 2.30pm to 4.30pm and the green fee is ?30 which includes your meal as you come in of the course. For non-members and visitors the green fee is ?35. We ask all our members to contact Dominic on 087 3130504 and we have a most welcoming visitors section so please contact us for a time slot. Time slots are every half hour starting at 2.30 to 3.00 and you must be ready 15 mins before your booked time slot. So why not join us and our Captain on Irelands oldest Golf Club and Golf course. Make that call to 087 3130504 to book your tee time. OUR NEXT PROJECT IS PLANNED FOR CORK CITY ON THE 23RD 24TH JULY NEXT. IT IS SCOIL IOSAGAIN IN FARRANREE WHERE WE WILL BE PAINTING SOME CORRIDORS AND CLASSES. ALL LEVELS OF PAINTERS ARE WELCOME AND THIS IS AS STRAIGHT FORWARD AS IT GETS. FRIENDS AND FAMILY ARE AS ALWAYS WELCOME ON THIS PROJECT. It is with regret that I inform you of the death of Joe (Joseph) O Reilly ex South Lott’s Rd and Fleet St. who passed away on Friday 1st July ’16. Funeral Arrangements: Reposing at the Brian McElroy Funeral Home, Crumlin Village on Sunday from 12 noon to 3pm and on Monday at his home from 5pm to 8pm. Funeral on Tuesday after 10am Mass in Church of Our Lady of Good Counsel, Mourne Road to Newlands Cross Cemetery. I regret to inform you of the passing of Mícheál Loughlin, brother of our friend and colleague, Cyril Loughlin. Removal on Sunday evening from Dublin to Leitrim and burial on Monday 4th July. Funeral details have yet to be clarified. Check on RIP.ie for further details. Our thoughts and prayers are with Cyril and his family at this sad time. 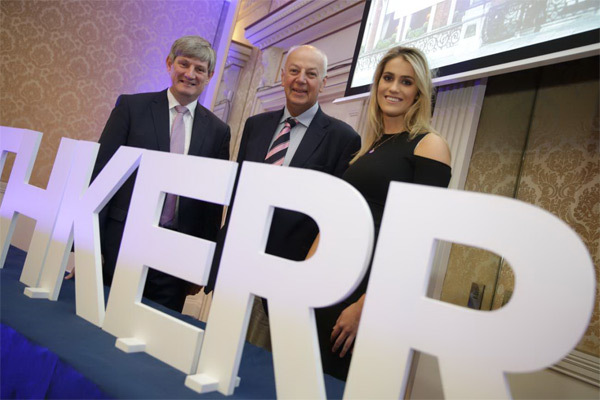 Yesterday, 30th June 2016, UCD Smurfit Business School and Electric Ireland hosted the annual summer Marketing Development Programme Business Breakfast in the Shelbourne Hotel, Dublin. “Leadership and Innovation in a Competitive Marketplace”. Drawing from his experience with a number of successful Irish start-ups, Bobby spoke of the importance of remaining creative and innovative when operating in a competitive market. Our customers drive our business. It is important to have a value proposition and value doesn’t have to mean cheap. Value means offering customers something so good that keeps them coming through the door. He attributes his success to a number of key factors including setting realistic goals and targets, having a real brand strategy and the importance of integrity. The UCD MDP takes a leading role in facilitating the development of professional marketeers by providing students with the opportunity to work as advisors on commercial projects and gain practical experience. The 2016 ESB World Cup 5-a-side soccer competition will take place in Sportsco on Saturday 15th October. More information to follow shortly. Andy Cross in Naas is retiring. Andy is marking his retirement with a function in Lock 13, Sallins, Naas on Friday 1st July 9pm till late. The count for the election of two member Trustees of the ESB DB Pension Fund was held today and the following candidates were elected. We would like to thank all candidates for their efforts and interest in becoming a member Trustee of the ESB DB Pension Fund. Squash Coaching (6 weeks) – Tues 5th July 6.30pm Beginners; Thrs 7th July 6pm Intermediate. ?70 members, ?85 non members. Yoga (4 weeks) – Monday 4th July 6pm All Levels; ?60 members, ?65 non members. Pilates (5 weeks) – Wednesday 29th June 6.30pm Intermediate; ?65 members, ?70 non members. Tennis (6 weeks) – we have some last minute places on our Intermediate/Advanced level this evening at 8pm! ?70 members, ?85 non members. Call us to book! 01 6687022 xt 0. SPORTSCO – helping you keep fit and healthy this Summer. As you may know, I retired from ESB/Electric Ireland last month. Working for this company has contributed greatly to both my personal and professional development. After 40 happy and productive years, I leave with many memories to cherish for the rest of my life. I also want to send a huge thank you for the wonderful retirement party. Thank you to each and every one who attended, I really appreciated all of the kind words and well wishes, presents and fantastic collection and I will never forget the thoughtful and touching presentations. As I look forward to a new life after my retirement, I will certainly miss the enjoyable time I have spent with you all. The next outing for the club is Saturday July 9th in Rathcon, a club favourite with big hard fighting Rainbows. Rathcon is located close to the Kildare / Wicklow border and very accessible from the M9. Everyone is welcome to attend, including non members and indeed non ESB staff, regardless of ability. For more details contact Club Secretary Peter O’Hagan on 0879815904 for more details. It is with deep regret that we wish to inform you of the passing of Brendan, father of our friend and colleague, Paul Newe. Reposing at home on Tuesday, from 4 o’clock. Funeral on Wednesday after 11.30 o’clock. Mass in St. Agnes’s Church, Crumlin Village to Bohernabreena Cemetery. Our thoughts & prayers are with Paul and his family at this time. Reposing at his son Aidan’s residence Spittalstown, Wednesday 29th from 3pm, with Rosary at 9pm. Removal Thursday morning to SS Peter and Paul’s Church Horseleap arriving at 11.45am for funeral prayers. Funeral mass at 12 noon, burial afterwards in adjoining cemetery. It is with deep regret that I inform you of the passing of Brendan, father of our friend and colleague, Paul Newe. Reposing at home today (Tuesday), funeral is after 11:30 mass in St. Agne’s Church, Crumlin Village. Maureen Kitson – Mother of Liam Kitson and Mother-in-Law of Dermot Moran, Moneypoint. The death has occurred of Maureen Kitson nee Fitzpatrick (RIP), Mother of Liam Kitson and Mother-in-Law of Dermot Moran, Moneypoint. Reposing at Kennedys Funeral Home Ennis on this Saturday evening from 5pm with removal at 7pm to Ennis Cathedral. Funeral mass on Sunday at 1.30pm with burial afterwards in Templemaley Cemetery, Barefield. Family flowers only please, donations if desired to the Jack and Jill Foundation or the Lauralynn Children’s Hospice.